Save the Dates are an essential item to consider while planning a destination wedding, and it’s often overlooked in the wedding budget. I’m not one of those types that will spend hours upon days upon months stressing out over something that will eventually be thrown in the trash. I hear horror stories all the time of how brides have succumbed to spending several hundred dollars on paper, just because they needed to have lace on it. That is just so not me. When we originally picked our date, I actually found an online promotion that was running for free postcards on Staples.com. Score! I scooped up 100 for $20 (I only had to pay for the shipping). Although it was a little strange to have info printed on the front and the back, it was practically free, so I didn’t really care. So, after much searching, I was able to find the same design (turns out Staples uses Vistaprint, too) for a lot cheaper than most stationery websites. 100 STDs plus envelopes for $60 – not bad… AND they were real STDs (not postcards like before). Luckily, they came in the mail just in time for the engagement party, and we set them out on the gift table so that everyone would see them. This ended up saving us some money and the hassle of getting everyone’s addresses right away (even though I still need to do that eventually). Do you have any money-saving tips when it comes to this type of stuff? 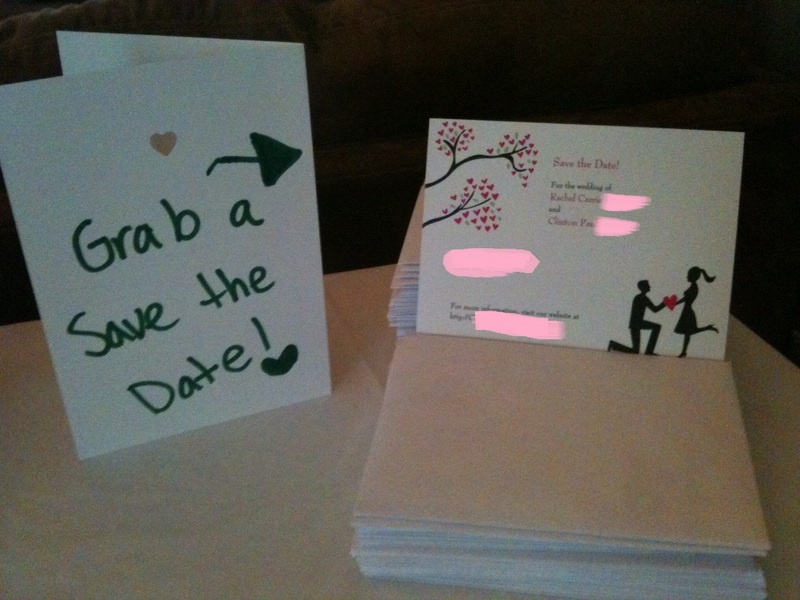 I’m even considering making my own invitations (or at least making my friends do it). I printed and made my own invites. I found invites and decorative sleeves for the invites all at Joanns. Printed at home, assembled and even added a punched hole at the top to tie a bow. Turned out great and they were easy!